Having a safe, reliable source of power is crucial for the continuous operation of any electrically powered piece of security equipment, and for the integrity of the overall installation. Given that the electricity supply incoming from Eskom is often unreliable, it is imperative that security installers make adequate provisioning against disturbances to that supply. Broadly speaking, disturbances fall into three categories: brownouts, spikes and blackouts. Brownouts occur when the voltage of the incoming supply falls below a threshold which is adequate for a device to function correctly. The classic example of this, and one which most of us will be familiar with, is when the lights dim or flicker for a short period, and certain appliances may even switch off or reboot. 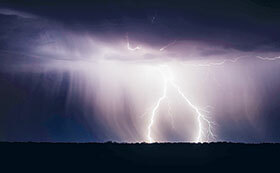 Spikes can be caused by fluctuations in the AC electricity supply, which power utilities have systems in place to guard against but sometimes slip through the net nevertheless, and by surges induced by lightning strikes, which are much harder to protect against and much more devastating in their effects. As for blackouts, suffice it to say that’s like what happens during load shedding. While it may be out of the hands of security end-users to guarantee a reliable electricity supply, there are some key aspects that they can, and should, exercise as much control over as they reasonably can. These include the use of high-quality power supply and backup equipment, and employing trusted, reputable and professional installers and system integrators. While not set in stone, there are also some rules of thumb that can aid the decision-making process when planning and specifying equipment. Roberto Vizcarra from Eurobyte Technology says the specifying process depends on the type of electricity irregularity that must be catered for. “Short, intermittent cuts can be resolved by using a quality online UPS, or a system consisting of an inverter plus battery bank,” he explains. “These would need to be charged from the grid and could provide power for a good couple of hours depending on how much battery storage you have. “For more intense outages, most professionals would recommend a battery bank system which would be connected to the grid, as well as alternative energy sources to assist power stability. This could include a variety of options such as generators, solar or, in less frequent cases, wind turbine technology. Especially for equipment that is located outside, a key consideration is the avoidance, or at least mitigation, of lightning damage. Beyond that, maintenance is essential to ensure that equipment is in optimal working order at all times, and to obtain the best working life out of it. Vernon Kyzer further recommends that proper earthing is done, backed up by one of Clearline’s surge arrestors, which can furthermore be brought to the company for testing to ensure the unit is still in good working order. Vizcarra goes so far as to say that for high incident areas such as Johannesburg, surge protection should be a standard requirement, attached to each camera and every piece of equipment. For more extreme cases, he says lightning poles mounted above cameras to divert energy away from the cameras may also be an option.